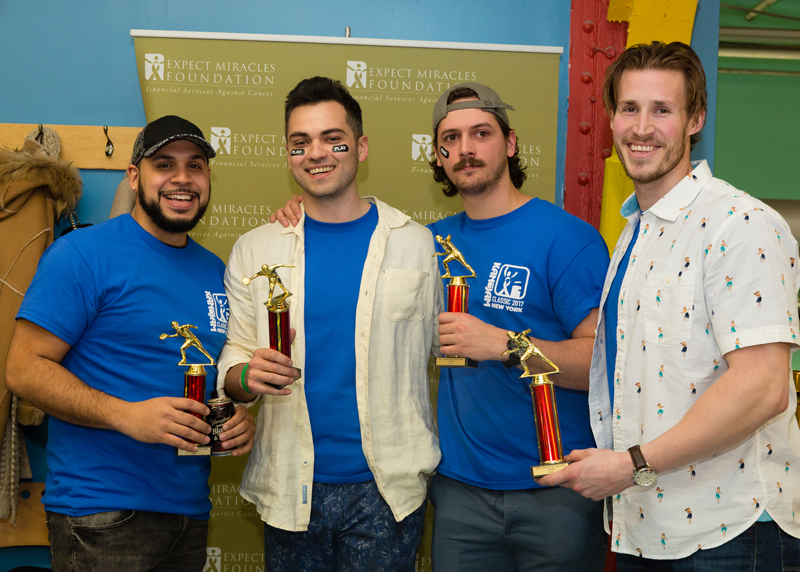 On Friday, April 7 over 170 young professionals joined together at Chelsea Piers Field House for the Inaugural Expect Miracles Kan Jam Classic in New York. This event kicked off its first year with an unbelievable 24 teams competing and fundraising for cancer research and the Expect Miracles Foundation college scholarship, awarded annually to a student who has been affected by cancer. Thanks to the efforts of all of our dedicated teams, sponsors, and guests who came to support Expect Miracles Foundation, this event raised commitments of over $20,000, shattering our fundraising goal! Special thank you to our Tournament Sponsor, Commonwealth Land Title Insurance Company and all of our amazing sponsors, event partners, teams, spectators, and volunteers. Teams of 2-4 battled it out in the Kan Jam competition while spectators cheered from the sidelines. Guests were able to relax, mingle and play games such as boccee, corn toss, and jenga in a spectator lounge provided by Tommy Bahama. Players and spectators cooled off with Essentia water and the variety of options of beer, cocktails, and other beverages provided by Owl’s Brew, Spiked Seltzer, Tito’s Handmade Vodka, Yuengling, and Zonin Prosecco. All guests were also able to savor food generously donated by local restaurants including Alidoro, Doughnuttery, Filaga, Five Napkin Burger, Insomnia Cookies, and KIND Bars. Congratulations to our top Kan Jam teams, who walked away from the night with something better than food and free swag – bragging rights and trophies! This year, the honor of Kan Jam Classic Champion went to Team Tommy Bahama closely followed by Team Get it in The Slot in second place, and Team Rye Garnets in third place. Congratulations to the night’s overall fundraiser, Emily M. who raised over $800 for Expect Miracles Foundation and walked away with FOUR Mets Tickets including Parking Pass as a prize for her amazing work fundraising. Thank you to all of our teams who worked so hard to fundraise and make the Inaugural Expect Miracles Kan Jam Classic in New York City so exciting and competitive. As always, special thank you to our amazing volunteers who donated their night to help support Expect Miracles Foundation and the fight against cancer. We couldn’t do it without you. This past year was Expect Miracles Foundation’s first year hosting young professional events in New York and thanks to all of you we have had some amazingly fun times and fundraised thousands of dollars. We are grateful to all of the generous companies and individuals who support us since the beginning and look forward to another amazing year. Stay tuned for more events to come.